"Post Cards in Paradise" is back! This miniature 5"x7" oil painting on canvas, mounted on panel is the first of several paintings you will see in my Miniature Painting Auction. Bids start at just 99 Cents and may be offered until 6 PM. Tuesday February 7. Email me with your bid. This is one of several lakes in Hopkins Prairie in the heart of the Ocala National Forest. 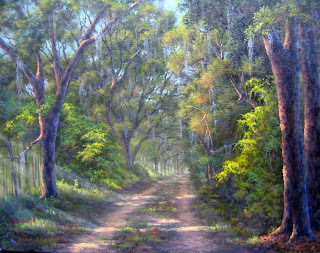 I painted it on a beautiful day recently as I trekked through the woods with Steve Andrews, a super plein air painter. A big storm was brewing to the east so there were no gators or birds to be found. My show schedule usually fills up fast this time of year. January gives me a respite from the hectic pace of the holidays before the hectic pace of shows descends upon me. 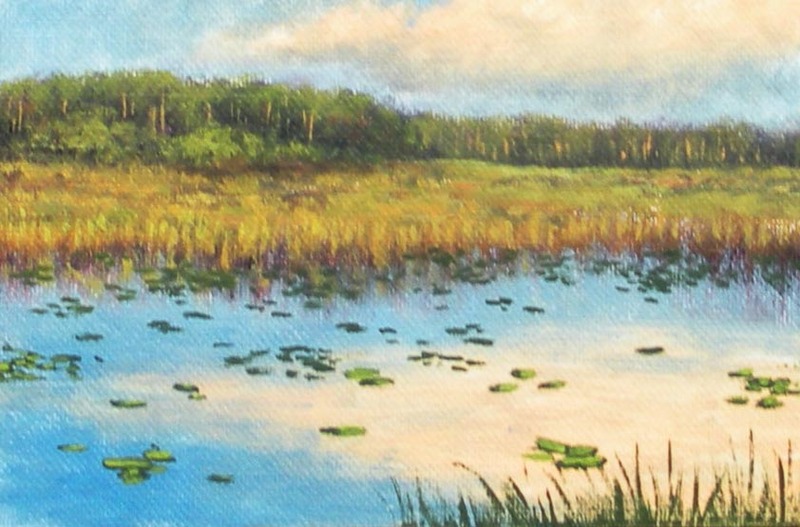 Two events were in January, my show at Thornebrook Gallery in Gainesville Jan. 13 - 28, and Marion Cultural Alliance's "Artist Within" banquet last Saturday at the Ocala Country Club, which was all play since the work had been done. A great evening with friends that raised a lot of money for the arts in Marion County. February continues the hiatus with only a couple of things scheduled for MCA's "Horse Fever" Fund Raiser. Then comes March! My dear friend Susan Cassens and I are having a joint show at the A.E. Backus House in Ft. Pierce March 1 - 31. 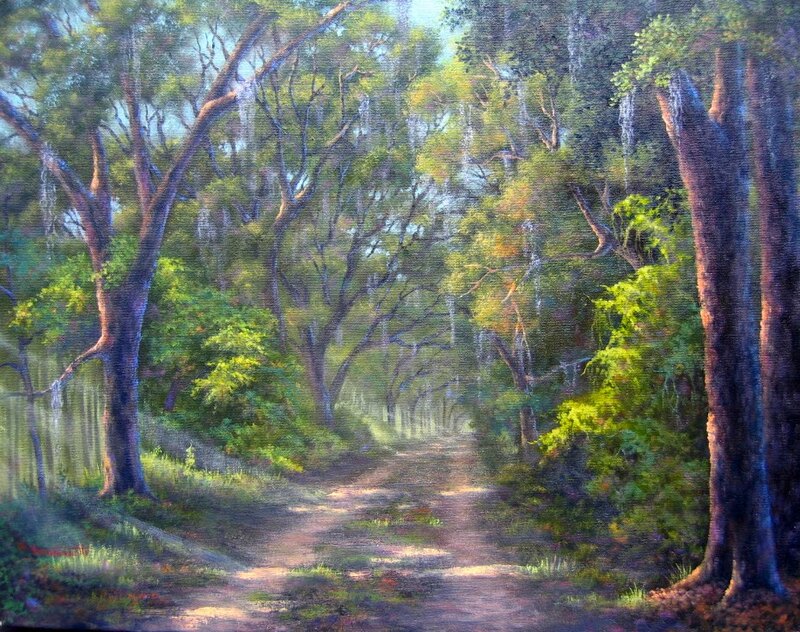 After the opening reception I head over to Wekiva State Park in Apopka for the week long paint out March 5 - 11. I get a week off then on to Epcot march 22-25. April is packed too. Gainesville's Downtown Spring Arts Festival is April 14-15. I get 2 days to unpack the truck and repack for the Ft. Pierce "Souvenirs of Downtown" Paint Out April 18-21. If you get by to see any of the shows or paint outs please say Hi. I previously wrote about a painting I was commissioned to do as a secret Christmas present. Because it was a deep dark secret that very nearly got out - but that story can keep until another time - I couldn't post the finished painting until after Christmas. Well, it is now near the end of January already so I thought I had better get back to keeping in touch with you all and post the image. 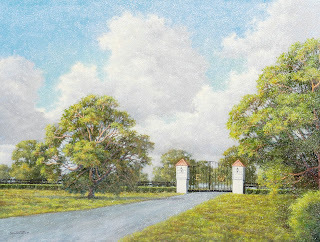 This is the entrance to the Eddie Woods Horse Farm in Ocala, Florida. It is a beautiful farm complete with barns filled with magnificent thoroughbred race horses and a world class training track. The rolling hills though out the property add just the right touch of tranquility. Eddie's sweetheart Angela commissioned the 30"x40" painting. 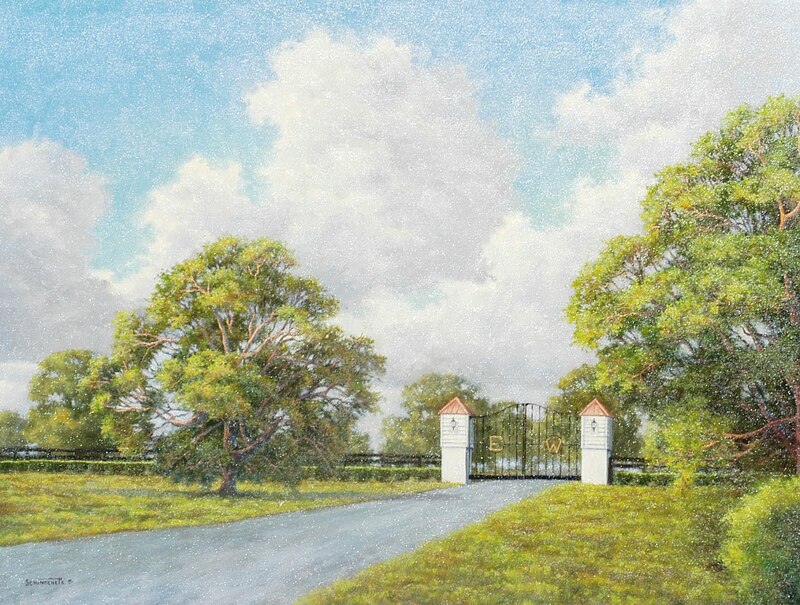 She instantly became my sweetheart when she said "I want the entrance gate to be prominent but I also want it to be a painting not a photograph." Music to an artists ears! She gave me permission to paint a landscape and put the gate in it. Visiting the farm to gather reference material was exciting. Creating the painting was challenging. Getting to know Angela was a personal treat. 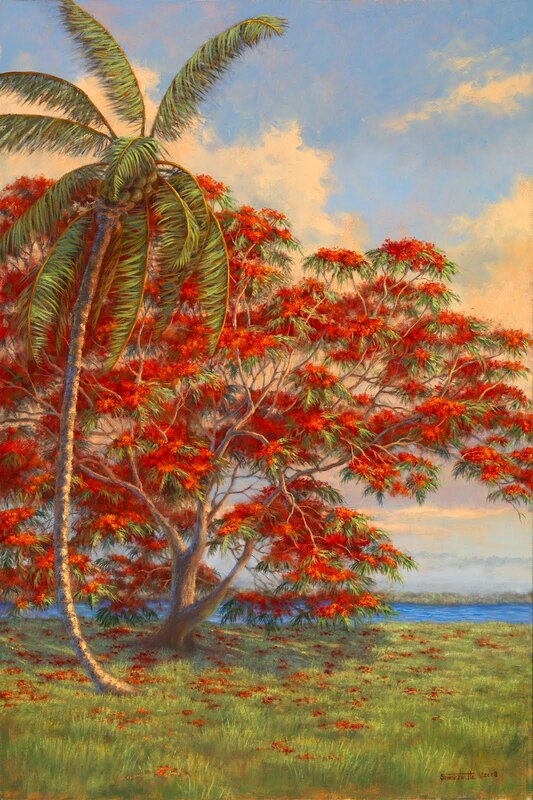 The Royal Poinciana Tree is spectacular when in full bloom. It flourishes in the tropics and south Florida where I was born and raised. They line the streets of Coconut Grove and Coral Gables forming a graceful arch over the streets much like the oak trees in the northern part of the state. After intently looking at this painting a gentleman commented "these are such beautiful trees....I love them....in somebody else's yard". I was invited to participate in a great fund raiser for the arts called "Artist Within" organized by the Marion Cultural Alliance. This event not only raises money for the arts but also raises awareness about the thriving arts community right here in Ocala and Marion County. This is how it works: anyone interested in participating pays a stipend to MCA and tells the committee what type of artwork they would like to create. They can select an artist themselves or the committee can pair them with an artist who creates that type of art. Then the fun begins! Ronnie (Veronica) King wanted to paint and work in oil so, I was lucky to get paired with her. Over a period of several months she came to Sabal Palm Gallery as often as her busy life would allow, mother of two, wife of a doctor and she is a lawyer also. After much discussion Ronnie chose flowers as the subject of her very first painting. We worked from photographs and life (when I could find the flowers blooming). I soon learned she has natural talent and grasped the information quickly. The painting she created is outstanding...I can't wait for the unveiling this weekend. All of the artworks created for the event are kept secret until the banquet. When Ronnie's family and friends see the painting I know they will be as proud of her as I am. And there is no doubt that her husband will outbid everyone else! Margaret Watts created "Ocali Sun" in the original Horse Fever Herd, "Brick City" in the current 10th Anniversary Herd and has offered this great design "Sports Horse" for the People's Choice competition. 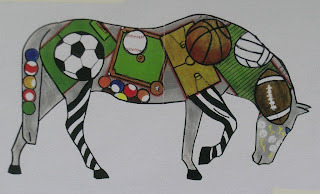 I encourage everyone to visit www.ocala.com/horsefever, click on the Survey Link and Vote for "Sports Horse". Voting deadline is Jan 12 - 29. Ocala and Marion County are proud of all the sports opportunities available. 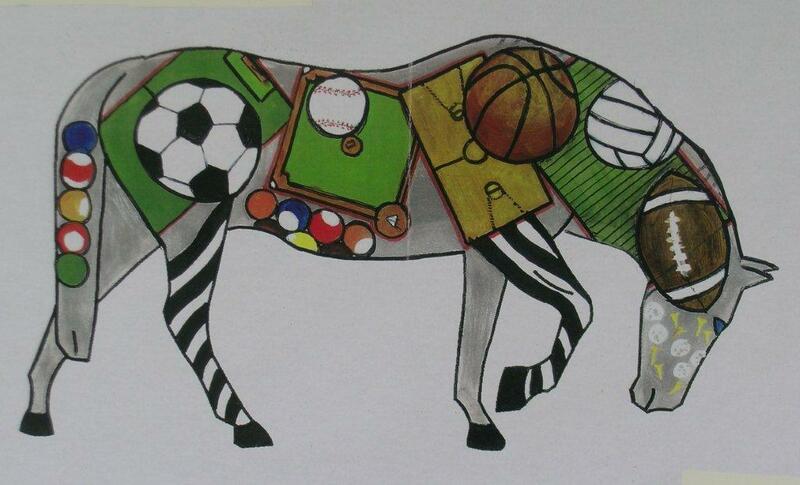 "Sports Horse" represents many of the sports offered to all the citizens throughout both the city and county and would be a wonderful addition to the 10th Anniversary Herd. My show/sale titled "The Out of Towners" at Thornebrook Gallery in Gainesville opens this Friday, January 13 with a Reception 6 - 9 pm. I will be at the Reception Friday night and look forward to sharing information about my 16 original oil paintings in the show. All of my paintings are inspired by plein air studies created on site so every painting has a story. 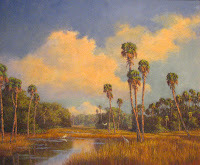 Visit www.thornebrookgallery.com for more information. The gallery is easy to find if you know where Fresh Market is, if not, the address is 2441-6D NW 43 Street, 1-800-449-4947 or 352-378-4947. See you there!!! 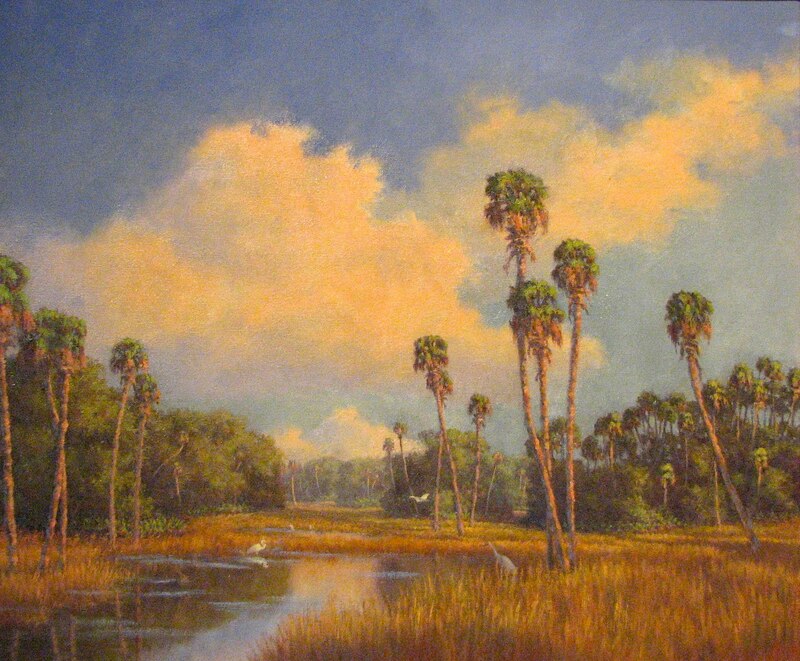 Ocala Chamber of Commerce invited me to have an exhibit in their office at 310 S.E. 3rd Street on the corner of 3rd and Watula. The show will be installed today with it running through March. This will be an exhibit of some of my Fine Art Giclee Reproductions on Canvas. Giclee Reproductions are a great option for private homes and offices at a very affordable price. Above is just one of the 25 images available as a Fine Art Giclee Reproduction. Stone Sculptor Mel Miller is January's Featured Artist at Sabal Palm Gallery in Ocala. Miller received a B.A. from the University of Mississippi and earned his M.L.A. from Western Maryland College. Mostly self-taught, he also studied under Dale Enochs in the Montoya Famous Sculpture Series in West Palm Beach. The Champagne Reception is 6 - 8 PM Friday Jan. 6. All are invited to this FREE event. Chat with Mel about his stone sculptures that show fluid motion and dramatic movement. "The simple presentation of a form is limitless but the portrayal of the spirit within the resulting sculpture is difficult to achieve. Doing so is very satisfying."